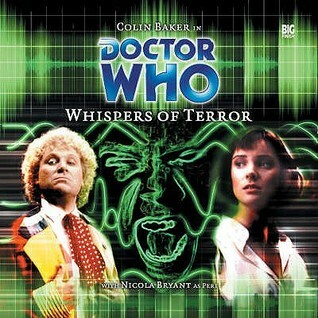 ‘Whispers of Terror’ represents Big Finish’s first individual outing for Colin Baker’s Sixth Doctor and Nicola Bryant’s Peri, placing them in the Museum of Aural Antiquities. However, people are dying in the Museum and the wording and inflections of speeches from recently deceased esteemed actor Visteen Krane are being slightly modified, and the Doctor and Peri soon team with the Museum curator Gantman to determine just what is going on. Writer Justin Richards offers a script that truly focuses on the auditory experience, and the atmosphere invoked is almost tangible. Quite quickly it becomes apparent that a creature made of sound is on the loose, the question becoming how it and the seeming changes of Krane’s speeches relate to the upcoming Presidential election and Beth Pernell, whom Krane’s recordings endorse. Big Finish is certainly kinder to Baker than television ever was, and here he is allowed to relax and to explore the inner workings of his Doctor to marvellous effect, gracefully allowing his inquisitive and compassionate nature to complements and even subdue the more bombastic nature that was such a point of focus in his 1980s tenure. This is a more consistent Sixth Doctor, and one immediately more likable and approachable, and while there is still some of the trademark spatting between Peri and the Doctor, this no longer dominates their relationship as tenuously displayed on screen. Just as aptly as Baker returns to the Doctor, Bryant steps back into the role of Peri with natural ease, demonstrating equal growth and maturation on her part. The supporting cast here is superb as well. Doctor Who veteran actor Peter Miles’s Gantman is committed to the importance of his job, and his exhaustive knowledge of Krane and his recordings prove crucial to understanding the plot at hand. Lisa Bowerman of Big Finish Bernice Summerfield fame is just as dominant a force as Beth Pernell, a woman who would seemingly go to any lengths to get what she wants. As the plot progresses, the identity and driving forces of the sound creature become apparent. While initially the creature seems to be focused on murder at all costs regardless of the victim, eventually a more subtle motivation is revealed, allowing for a clever tale of deceit and revenge to manifest. However, while timely in its own right, the big reveal of the creature’s identity so early in the story hinders the progression of the plot and leaves events churning in place for some time in order to fill the four episodes allotted. Though this is only the third release in Big Finish’s main range, each release has substantially improved upon the previous. Both leads and the supporting cast are excellent in this imaginative script as the mystery is slowly revealed and uncovered, and the incidental music truly evokes the 80s experience. With a more compassionate Sixth Doctor that should continue to be more fully fleshed out going forward, ‘Whispers of Terror’ is a strong start to Colin Baker’s solo outings with Big Finish.